While the day has yet to come where pigs are able to fly, many unique animals have evolved over time to allow for flying and gliding capabilites. Some of these strange creatures include the flying fish, flying squirrel, and gliding lizard. These animals are not quite capable of flight on their own, but have adapted to their environments by learning how to glide. Researcher Matthew Heinicke and his colleagues from University of Michigan at Dearborn have come to the conclusion that gliding has independently evolved eight times in the forest. Heinicke also stated that six of those eight gliding evolutions occured between 20 million and 50 million years ago, at the time when the dipterocarp tree was spreading across Southeast Asia. Gliding lizards have been known to live in dipterocarp tree forests, as they are huge canopy-like trees that spread all over the entire forest. The Draco lizards originally split from the lizard family and were the seventh group of gliding evolution – dating back 60 million years ago. The Draco lizards evolved in India and their evolution is attributed to the dipterocarp tree. For the lizards it was simply more energy efficient to glide from tree to tree rather then climb down one and climb up another. A small creature such as the Draco lizard would have to devote much of its day climbing up and down the humongous dipterocarp trees if they were incapable of gliding. For a full explanation on how the draco lizard actually glides, watch the video below. Heinicke also says that the Draco lizard paved a path for the evolution of flight in both bats and pterosaurs despite the fact that they are very different today. 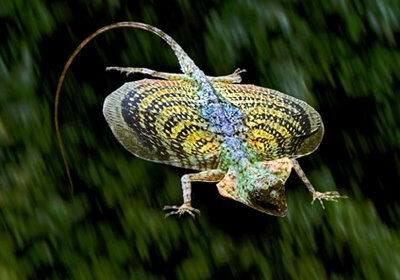 The gliding lizard was capable of flight long before birds even existed!